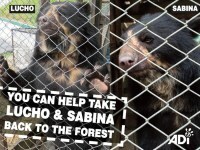 ADI has launched an emergency appeal to rescue two more spectacled bears called Lucho and Sabina. Lucho and Sabina have been stuck in a private facility following their seizure by wildlife officials. Lucho is an 11-year-old male, who, like Cholita, was with a circus; Sabina is female, just 4 years old and was taken from the wild as a baby, a victim of the illegal wildlife trade. Just weeks ago, ADI and our Projects Abroad friends completed construction of a forest habitat for Cholita at Taricaya Reserva Ecologica in the Amazon basin. Cholita’s sad life won the hearts of people all over the world. Mutilated in the circus, her fingers were cut off and her teeth broken and Cholita has lost all her fur due to stress. In an epic journey over the Andes and then up the Madre de Dios River, ADI took Cholita back to her native land. It was magical to see Cholita licking the earth, exploring, reaching up into the trees, tasting leaves and sniffing under logs. She was home and her life has been transformed by the generous donations of ADI supporters like you. Now, we can do the same for Lucho and Sabina who, if we act quickly, can join Cholita in the forest. They have lived in appalling conditions for many years and have never received any kind of veterinary attention. With your help we can transform the lives of these bears and after a lifetime of loneliness, sweet Cholita has a chance of sharing her forest home with some bear neighbours – they will be right next door. The authorities have said we must act quickly or they will be handed over to a zoo. To help save money, Projects Abroad volunteers are going to complete construction of the two bear habitats at Taricaya. In the next few days we must raise £10,000/$15,000 for the final building materials, transport, and food and veterinary care for the bears. PLEASE HELP to get the sad but beautiful Lucho and Sabina back to the Amazon and their native home and give Cholita neighbours of her own kind. Read about Cholita’s rescue and Operation Spirit of Freedom and WATCH HER STORY BELOW!